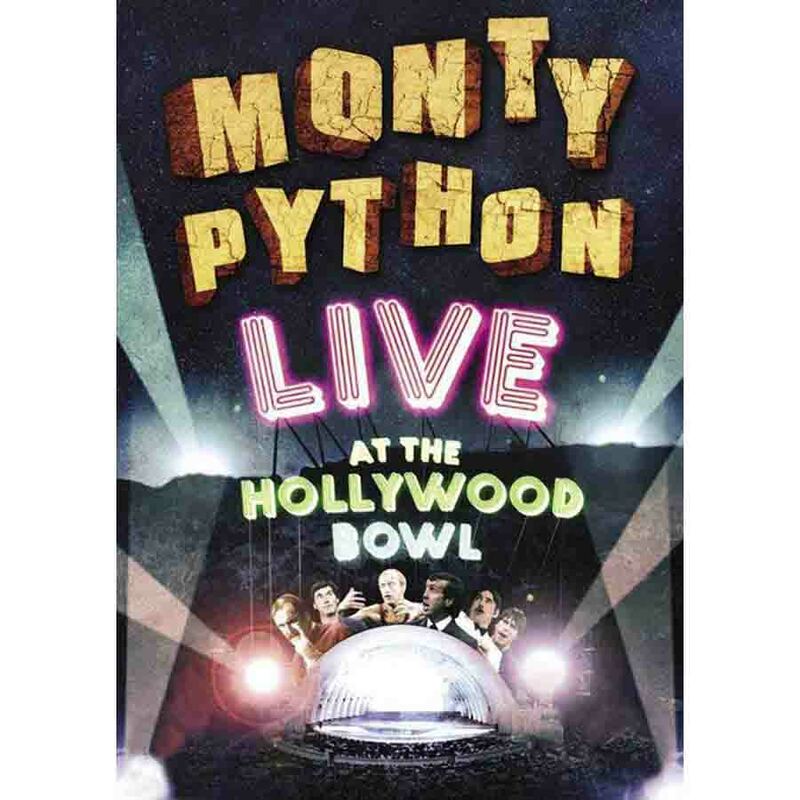 "Monty Python Live at the Hollywood Bowl"
Shot on video, this compilation captured the jovial atmosphere of the Pythons' September 1980 concerts at the Hollywood Bowl in Los Angeles. The film is a party by and for Python fanatics, with an audience of about 8,000 (many in Gumby get-ups) cheering and hooting each recognizable bit, reciting dialogue along with the cast, and engaging in sing-a-longs with the Bruces. The show is a mixture of Python warhorses (Ministry of Silly Walks, Camp Judges, World Forum, Crunchy Frog, Albartross, Nudge Nudge; Argument Clinic, Travel Agent, Salvation Fuzz); songs ("Sit On My Face"; "Never Be Rude to an Arab"; "Philosophers Song"; "Lumberjack Song"; and "How Sweet to Be an Idiot" and "Urban Spaceman" by Neil Innes); Gilliam animations (such as the Flasher Love Story); and film clips from the group's German TV shows, “Fliegender Zirkus”, (including the Silly Olympics, Philosophers' Football Match, and Little Red Riding Hood). There is also some pre- and post-"Flying Circus" material: the "History of the Joke" comedy lecture, from "Cambridge Circus"; the Four Yorkshiremen sketch from "At Last the 1948 Show" (written by Graham Chapman, John Cleese, Tim Brooke-Taylor and Marty Feldman); and the Pope's meeting with Michelangelo about the "Penultimate Supper," a Cleese-Chapman sketch first performed by Cleese and Jonathan Lynn at the 1976 Amnesty International Benefit. As a "Greatest Hits" compendium, it features some of the best performances by the group, notably Chapman's solo wrestler, Colin "Bomber" Harris; Eric Idle's loquacious Mr. Smoketoomuch; Michael Palin's camp judge; and Cleese's Minister of Silly Walks. The genesis of the Hollywood Bowl concert came out of the dissatisfaction the group felt over progress on their follow-up script to "Life of Brian." Unhappy with the preponderance of sketches, it was proposed by their then-manager Denis O'Brien, that they instead perform their live show in Los Angeles, being promised a very attractive fee. Planned as a concert film for potential sale to the HBO or Showtime cable channels, the recording of "Live at the Hollywood Bowl" was directed by Terry Hughes (who had directed two episodes of "Ripping Yarns," and whose later credits include the TV recording of "Sweeney Todd: The Demon Barber of Fleet Street," "Square Pegs," "The Golden Girls," "3rd Rock From the Sun" and "Friends"). It was shot using a live-to-tape camera system, similar to one used for such films as "Richard Pryor Live on Concert" and the play, "Give 'Em Hell, Harry." However, the resulting financial windfall from the L.A. shows never came. 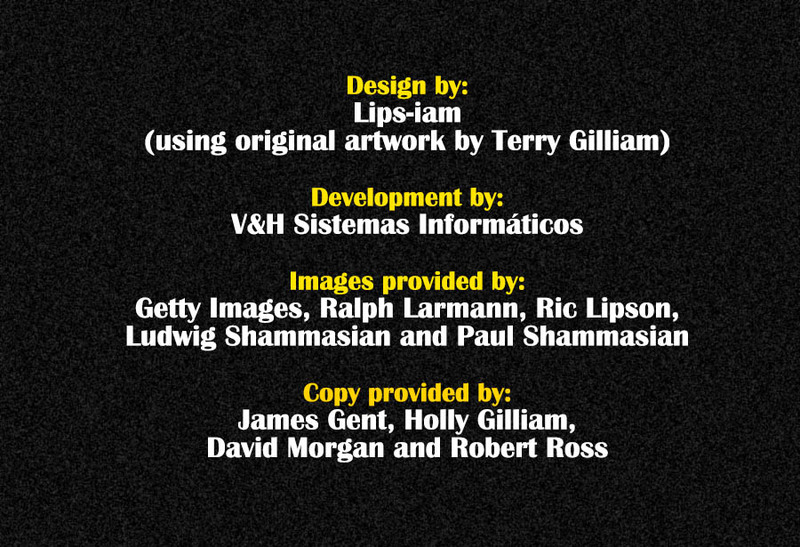 "We had taped the shows, and the money we were guaranteed we didn’t get," said Gilliam. "So we actually had to release the tape as a movie here in England to get the money we'd hoped to get from the stage show." The Pythons agreed to open "Hollywood Bowl" in theatres, and then on home video. The order of sketches was rearranged from the actual performance, and much was trimmed. With a running time of only 77 minutes, it is the briefest of Python films, but it captures the insanity of the Pythons' early stage shows, which had previously only been preserved on record albums.